Westwide SNOTEL basin-filled map March 16, 2019 via the NRCS. The Bureau of Reclamation today updated its monthly 24-month study projections, indicating improved hydrological conditions throughout the Colorado River Basin. 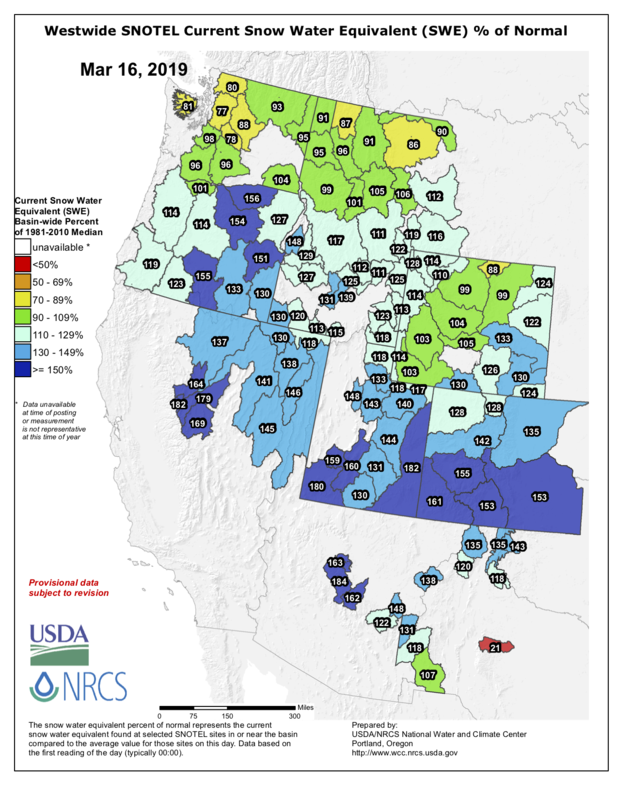 Current snowpack in the Upper Basin is nearly 140 percent of average, with a forecasted inflow to Lake Powell of 92 percent of average for water year 2019. In Reclamation’s March 2019 24-Month Study Lake Powell’s releases are projected to increase to 9.0 maf in water year 2019. Lake Mead’s elevation is projected to be 1,080.85 feet by year’s end. The operating tiers for Lake Powell in water year 2020 and the operating condition for Lake Mead in calendar year 2020 will be determined based on the projected conditions on January 1, 2020, as reported in the August 2019 24-Month Study.